This post is just gonna be a bit of an update as I went to Papworth for my Transplant clinic on the Friday just gone and just a bit of info for you guys on transplant week as well as that is happening from the 8th. So I went to Papworth on Friday (5th) just for a routine check-up type thing and I think I can officially say I have now met all the transplant doctors. I got to meet a doctor I haven't met and she was saying how she was making an effort to meet ALL the people who are waiting for transplants at Papworth and I hadn't met her yet so she wanted to meet me. Apparently my reputation proceeds me, she seemed to know a lot about me and I don't just mean normal medical stuff that she should know but a lot of my personality traits and stuff going on in my life type stuff which was odd but she did say the doctors tend to talk about me a lot and that she had very much been looking forward to meeting me which I think is obviously a very nice thing for her to say, if not slightly embarrassing. I now can't help but wonder what they say, but it can't be bad otherwise she wouldn't have wanted to meet me. Right? I also got see loads of the transplant co-ordinators on Friday which was odd because sometimes I don't see any or only one, but it was sooo lovely to catch up with them and have just little chats, they all knew I had, had my false alarm back in May and so we talked about that and also they seemed positive that my transplant will be this year because if I had a false alarm then they are confident that there aren't very many people similar to me within weight range, blood type, antibodies and all the other stuff they have to match up so thats a bit of a confidence boost, which we like. I was meant to meet my friend who had a transplant back in May but unfortunately she has taken a turn for the worse and I didn't want to get in peoples way so I decided it was best not to intrude, but hopefully she will get better and I have all fingers and toes crossed and as much positivity as I can muster going her way :). Now I'm not really doing anything for transplant week this year except going to a transplant event that I have been invited to at Papworth this coming Thursday. 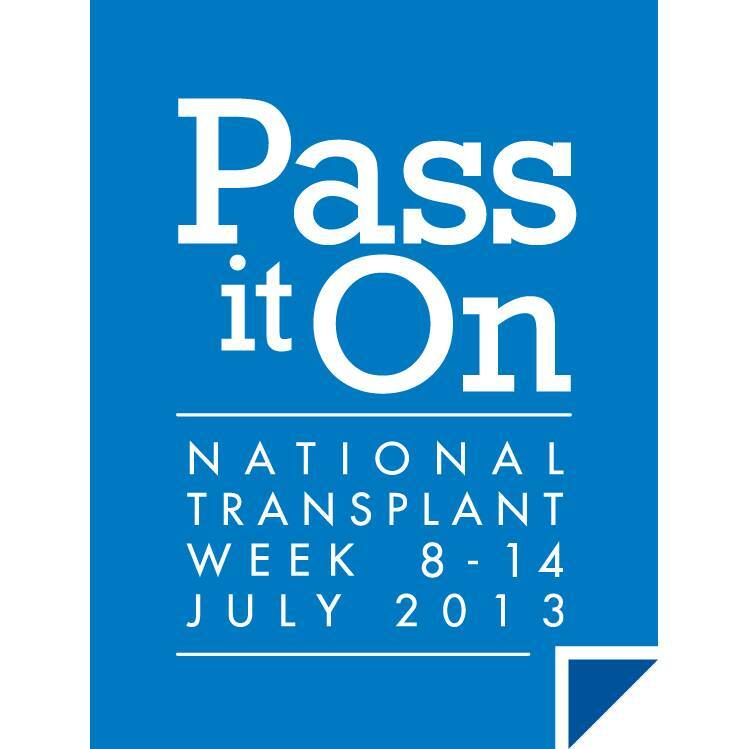 But the general gist of transplant week is as the picture above suggests to get people to "PASS IT ON" so basically just try and get people to recognise the serious shortage of organs in the UK right now. Try and get people to sign up if you can and if thats not possible just get people thinking about it and talking to their families about their wishes that type of thing. I'm not one of those people who is adamant that everyone signs up, I mean I would love it if they did, but I want people to be talking with their friends and families more than anything because ultimately if you were to die (heaven forbid) you actually have zero say, zero choice in what happens to you after, but if you have spoken to families and friends about what you want and have made it clear to them that you do or don't want your organs to be donated then that makes that decision a million times easier on them in a time where they probably can't even put a coherent thought together. But if they KNOW that is what you want they can follow through on YOUR wishes. There is always the link in my side bar if you want to sign up or just click here and that will take you right to it. So guys if you see anything on Twitter or Facebook this week involving transplant week just give it a casual Retweet/share/like just get involved and maybe just maybe you might just save someone life by doing that. She really was I also like doctors who are closer to my age they tend to be a bit more relaxed as well which Like :). It's not ignorant, it's not something anyone really thinks about until they are affected by it in some way. I'm the first to admit that if I didn't need a transplant and didn't know alot of people that need transplants I wouldn't think about at all. Thats why we try to raise as much awareness as possible because we know if we were in the position of people who aren't affected by it we wouldn't think about it either and thats why we have to try and make it a regularly talked about subject because you are actually more likely to need a transplant than you are to donate your organs which is crazy but true lol.